Explore our great range of BMW 3 Series alloys below. 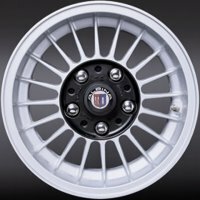 All of these alloys are approved to precisely fit the BMW 3 Series E21 and include the full range of Genuine OE BMW wheels. 13" Alpina Classic C71 "Black Centre"
15" Alpina Classic C71 "Black Centre"